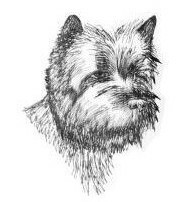 Cairn Terriers are intelligent, lively, strong, and loyal. Like most terriers, they are stubborn and strong-willed, and love to dig after real or imagined prey. Cairn Terriers have a strong prey instinct and will need comprehensive training. However, they are highly intelligent and, although very willful, can be trained. Although it is often said that they are disobedient, this is not the case provided correct training is applied; they are headstrong though, and should always be walked with a leash. A notable characteristic of Cairns is that brindled Cairns frequently change color throughout their lifetime. It is not uncommon for a brindled Cairn to become progressively more black or silver as it ages. The Cairn is double-coated, with a soft, dense undercoat and a harsh outer coat. A well-groomed Cairn has a rough-and-ready appearance, free of artifice or exaggeration. The dogs were used by crofters, shepherds, and foxhunters for pest control - foxes, rats rabbits were their early quarry, but with the advent in the eighteenth and nineteenth centuries of sporting pursuits, the dogs were much favoured for use against badgers and otters. Their “gameness” - the ability to ignore pain and continue to fight on - became legendary, and even at the beginning of the 20th century there were packs of Cairns that could not be handled by anyone other than their keeper! Dogs varied enormously in size, shape and colour depending on the terrain they worked, and the quarry they were used against. The origins of the Cairn Terrier are lost in the mists of time, but the dog is undoubtedly descended from the original indigenous working terrier of the Scottish Highlands and Islands. There are references to them in the sixteenth century, when King James 1 and V1 sent a group of Earth Dogges to the King of France. So prized were they, that he stipulated that they be sent in separate ships lest disaster befall them en route.